Private browsing mode and being logged out of Google offered very little filter bubble protection. Bing rolls social results into its search results. Amazon uses Bing for its FireOS devices, and its own A9 search engine for products. DuckDuckGo focused on Google because “Google is the monopoly provider for search by a landslide, with over 90 percent market share worldwide, and more than 95 percent in many countries,” said DuckDuckGo Community Manager Daniel Davis. 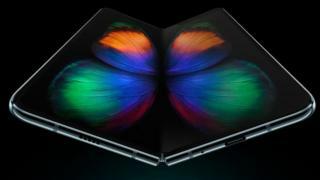 “As such, we focused on them to start, though we would love to see further research in this area,” he told TechNewsWorld. 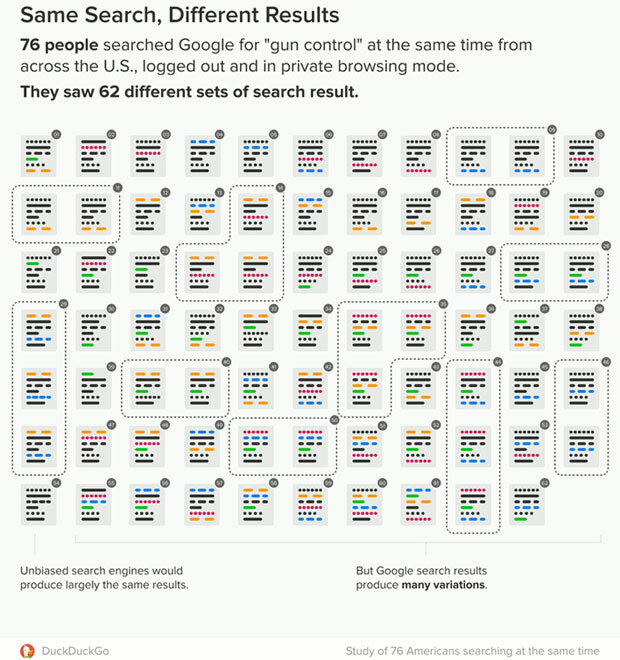 “Anyone that does a search comparison will see that for themselves,” he told TechNewsWorld. Vivaldi earlier this year became the first browser to enable DuckDuckGo as the default search engine in its Private Windows. For DuckDuckGo’s study, 87 volunteers across the United States searched Google on June 24, 2018, at 9 p.m. ET, using identical search terms. Seventy-six of them used desktops and the remaining 11 used mobile devices. They first searched in private browsing (incognito) mode while logged out of Google, then in normal mode. raw data from the search results. available on its GitHub repository. Most people saw results customized for them. In private browsing mode, logged out, a search for “vaccinations” returned 73 variations, with unique results for 70 of 76 participants. In normal mode, there were 73 variations, with 70 of 76 participants seeing unique results. DuckDuckGo looked only at websites’ top-level domains. To count variants of results, DuckDuckGo noted the order of the major elements: the organic (regular) links, the news (top stories) infobox, and the videos infobox. It ignored ads, sections containing related searches, and other infoboxes. Results from mobile devices were excluded when variations were counted because there can be significant variations in the number of infoboxes displayed by mobile and desktop devices. “Some people were shown a very unusual set of results relative to the other participants — offered some domains seen by no one else,” DuckDuckGo’s Davis said. “If you were one of these people, you would have no way of knowing what you’re missing,” he pointed out. The problem is “particularly pernicious when searching for political topics,” Davis said. can shift the voting preferences of undecided voters by at least 20 percent. “The issue with filter bubbles is that we live in an echo chamber, which means we only see, hear and act on what we prefer to,” observed Ray Wang, principal analyst at Constellation Research. “We never address the hard issues,” he told TechNewsWorld. The tradeoff is personalization and convenience, Wang said. Search results can change over time, with the inclusion of time-sensitive links, for example. 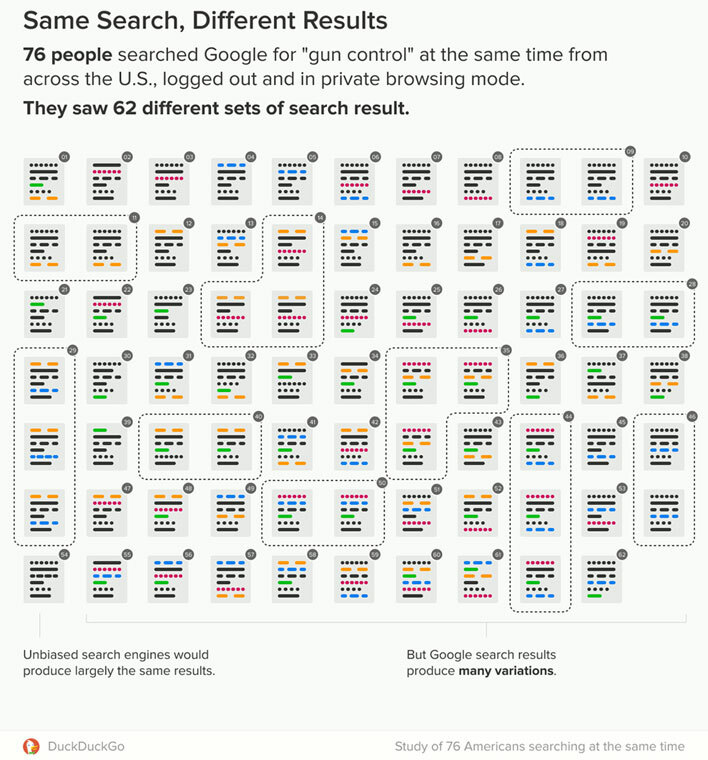 That factor was controlled for by having everyone search at the same time. Location can impact search results — by including local news articles, for example. To control for that, DuckDuckGo manually checked all links, comparing them to the volunteer’s city and state, and replacing all of them with the same placeholder — “localdomain.com” for organic links and “local source” for infoboxes. So, if two users’ results differed only by a different local domain in the same slot, that would not count as different. However, the adjustment did not significantly affect overall variation, DuckDuckGo found. The study’s methodology and conclusions are flawed, because they are based on the assumption that any difference in search results is based on personalization, which is not true, Google told 9to5Google. 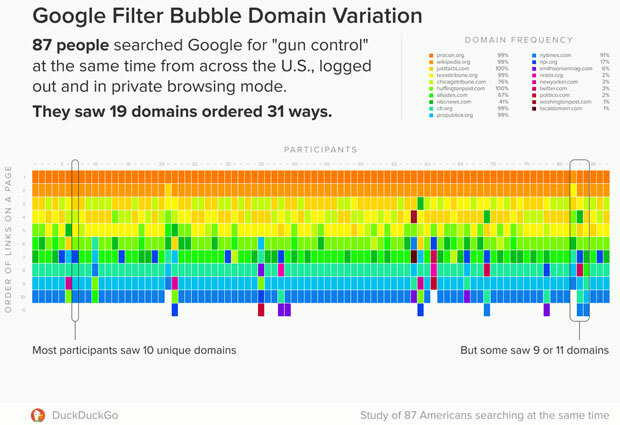 Time and location are among the factors that can lead to slight differences, and the DuckDuckGo study does not appear to have controlled for those two factors effectively, Google argued. Participants did not see the same results in private browsing mode. When randomly comparing people’s private modes to each other, there was more than double the variation than when comparing the private mode and normal mode results for the same individual, DuckDuckGo noted. This shows that Google tailors search results regardless of browsing mode, DuckDuckGo warned. However, “there is a slight possibility that the algorithm may be doing this and Google has not accounted for unintentional bias,” Wang suggested. “I believe Google is trying to provide the best possible search results, and that this is an unintended consequence of that work,” Vivaldi’s von Tetzchner said. Consumers should “use non-Google products” and reduce their digital footprint as much as possible, he suggested. “I use mostly Firefox and DuckDuckGo because of the privacy aspects,” Constellation’s Wang said. Richard Adhikari has been an ECT News Network reporter since 2008. His areas of focus include cybersecurity, mobile technologies, CRM, databases, software development, mainframe and mid-range computing, and application development. He has written and edited for numerous publications, including Information Week and Computerworld. He is the author of two books on client/server technology. FEMAIL tries out 10 hot cross buns in a bid to find the best supermarket offering; so which one won?